There are many materials used to restore teeth; I would like to discuss several of the most frequently used ones. 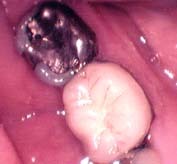 Amalgam is used because it can be performed quickly and economically, is a strong material, and holds up well over time. Composites provide an esthetic alternative for restoring back teeth and is the material of choice for front teeth. The current generation of composite materials has improved in physical characteristics; these restorations take more time to perform, resulting in a higher fee than amalgams. Gold is the strongest and most biocompatible material. It is time consuming and requires two appointments to complete. Porcelain is the most esthetic material and achieves a very natural appearance which is often indistinguishable from natural tooth enamel. Are amalgam restorations (silver fillings) safe? Are there alternative materials that can be used? The answer to both of these questions is yes. For more than one hundred years, billions of amalgam fillings have been used to restore decayed teeth. Amalgam has been proven a superior material because of its durability, longevity, ability to withstand the pressures of chewing, ease of placement, and cost effectiveness. All amalgam restorations contain various metals, such as silver, copper, and tin, as well as mercury. Mercury is necessary to chemically bind these elements together to form a hard, stable restorative material. When mercury is combined with these metals it becomes an inactive substance. Mercury is a naturally occurring element in the environment and can be found in trace amounts in food, water, and air. Consequently, there is always a very low level of mercury present in the human body. The daily dosage of mercury from non-dental sources exceeds the miniscule amounts released from amalgam fillings. There have been reports in the media of people being cured from a variety of illnesses when amalgam fillings are removed. These reports are not true! An overnight cure from serious disease is not supported by scientific evaluation. The Food and Drug Administration has concluded that, properly placed, amalgam causes no demonstrated clinical harm to patients and that removing existing amalgam fillings will not prevent ill health or reverse the effects of existing diseases. There are a number of other materials that can be used for patients that prefer an alternative. Gold can be used if the avoidance of amalgam is of prime concern. To avoid the use of all metals and to achieve the most esthetic result there are a number of tooth colored materials that can be used. Gold is one of the most biocompatible material used in dentistry. Gold retains its physical properties (it does not degrade in the oral environment) for the life of the restoration. Because gold expands and contracts at the same rate as the natural tooth it does not stress the remaining tooth structure. The gold restoration can be fabricated with precision to fit precisely within the tooth. Cast gold inlays and onlays are used on back teeth to restore decayed or broken teeth. This is a two-step procedure. On the first visit the tooth is shaped and an impression is made of the tooth. This is used to make a model from which the restoration is fabricated to be cemented at a second visit. A temporary filling protects the tooth between visits. Gold has many advantages over the amalgam filling. It has greater strength, withstands the forces of chewing better, and the fluids of the mouth have no degrading effects on the material, causing it to last longer. Because of the increased amount of time needed to restore a tooth in this manner and the higher cost of the materials, it is a more costly alternative--but a far superior one. Cast gold crowns are used on teeth that have more damage, where the entire tooth needs to be covered to give it more support and structural integrity. This is also a two-visit procedure. The final result is a strong, naturally shaped, and functioning tooth that will last a long time. For patients who do not want metal fillings or in areas of the mouth that are visible, the filling materials of choice are composites. These materials have made great strides in recent years and have improved to the point where they can be used with confidence. Composites are made of a plastic resin and a filler of finely ground glass-like particles. These materials can be blended and matched to the color of the existing tooth. The procedure to fill a tooth with composites is more precise and takes longer to perform than an amalgam filling. These materials are bonded to the remaining tooth structure. This gives the filling a strong and secure attachment to the remaining tooth. Generally, these materials are not as long-lasting as amalgam or gold, nor should they be used where a large filling or a crown is needed due to the loss of a large amount of tooth structure. In smaller fillings, especially where esthetics are important, composites are the answer. The amalgam restorations in the three teeth on the left have been replaced with bonded composite restorations as shown in the image on the right, achieving a very natural and esthetic result. Porcelain is the most esthetic material used in dentistry. It can be used for crowns, fillings, and as veneers to achieve a very natural appearance. Porcelain can be fused to metal when used as a crown. This provides a highly reflective, color stable material which achieves an esthetically pleasing and structurally strong tooth restoration. Porcelain will not change color after it is fabricated and cemented in place. This is not the case with other tooth colored materials. fig.5 This image shows a porcelain-fused-to-metal crown, a natural-appearing tooth restoration. The tooth next to it is restored with a very large amalgam, while not the most ideal solution, it has functioned well for over twenty years.